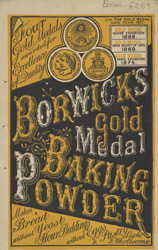 During the mid 1800s baking powder was produced commercially for the first time. For years housewives had made their own yeast to make bread and cakes rise but results were inconsistent and the taste was often very strong. Baking powders like Borwick’s released carbon dioxide gas bubbles when mixed with liquid and these caused the cake to rise. The great advantage of these powders was that there was no undesired flavour.